Fire, lightning, and frost spell impacts with their own unique textures. Copyright 2015 isoku. This item is not authorized for posting on Steam, except under the Steam account named isoku. Fire, lightning, and frost spell impacts with their own unique textures. I didn't want to stray too far from the vanilla textures but at the same time wanted to add my own touch. 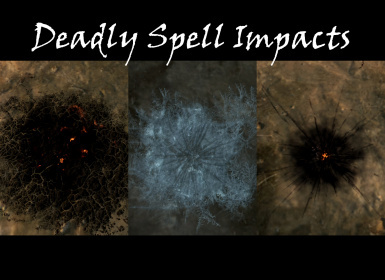 Greater variation in impact size within each spell. 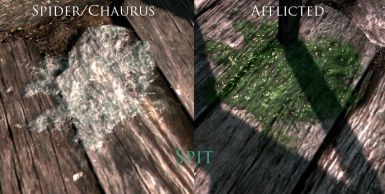 Lightning and spit impacts get their own textures. 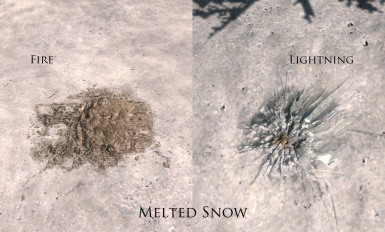 Melted snow impacts for fire/lightning spells (only works on what the game considers snow). Parallax ice effect for frost impacts and fire/lightning melted snow impacts. Increased dragon impact decals size. Increased glow map brightness so you can kinda see the embers in the dark. Two different fire impacts depending on spell (optional). Original resolutions vary from 256x256 for frost/spit to 512x512 for fire/lightning. High: 2048x2048 impact textures (1024x1024 uncompressed normals). Medium: 1024x1024 impact textures (512x512 uncompressed normals). Low: 512x512 impact textures (256x256 uncompressed normals). If you want the alternate fire impact for "missile-like" spells, rename the "00 - Data Required" file's decalflameburn01.dds, decalflameburn01_g.dds, and decalflameburn01_n.dds to decalflamespread01.dds, decalflamespread01_g.dds, and decalflamespread01_n.dds respectively. Copy "10 - Fire Cracks" files into the impactdecals folder. Finally place DeadlySpellImpacts - Two Fire.esp from the "40 Two Fire Esp" folder in your Data folder. You must load this esp after DeadlySpellImpacts.esp manually or through BOSS or it won't work. If you want to use an alternate impact for a school of magic then copy the files within the folder(s) and overwrite the files in your Data folder. Extract the textures folder and DeadlySpellImpacts.esp from within the "00 Data - Required" folder and place in [...]\steamapps\common\skyrim\Data folder. Extract the textures folder and DeadlySpellImpacts.esp from within the "00 Data - Required" folder and place in [...]\steamapps\common\skyrim\Data folder and overwrite everything. Delete impactdecals folder in data\textures folder and DeadlySpellImpacts.esp/DeadlySpellImpacts - Two Fire.esp in the data folder. Make sure there are no spell impacts present in your latest save when you uninstall. Make sure there are no spell impacts present in your latest save when you uninstall. >If you are experiencing crashes upon using a spell then you need to downgrade to a lower res version. If you already have the low version then I would suggest downgrading other texture mods installed. >If you're getting purple squares with the optional esp running then you need to read the customization instructions above and make sure you have the correct files installed. 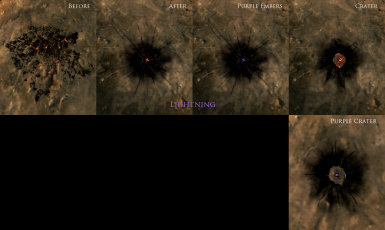 >If your lightning impacts are purple squares then make sure Load Loose Files is checked in Data Files in the Skyrim Launcher. Make sure DeadlySpellImpacts.esp is the only magic impact esp file installed and check to see that the impactdecals folder is in the data\textures folder. >If you aren't seeing any impacts go to Options in the Skyrim launcher, click advanced and increase your decal quantity.